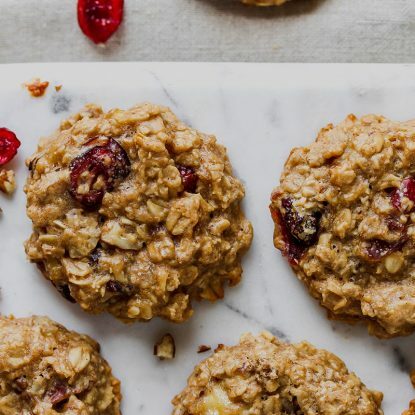 When you’re setting out on vacation, make sure you load up on these healthy travel snacks to keep the kids (and yourself) from getting the hangries. If you’re packing up the suitcases to set out by land, air, or sea during the spring break, summer, or holiday season, make sure you’re armed with healthy travel snacks to keep you feeling full and energized. Whether you’re traveling solo or with the kids in tow, traffic and flight delays surely are easier if you aren’t facing them with a severe case of the hangries. As a registered dietitian and mom that has survived one round-trip, cross country flight and dozens of road trips with a 4 year old and 2 year old in tow, I equally credit healthy travel snacks and screens to this success. Usually when we’re on a road trip to the beach, I pack a picnic basket and a small cooler with snacks, drinks, etc. When flying, I fill each girl’s backpack with her favorite snacks and a water bottle that we fill up at the airport. Here are a few items you’ll find in our cooler or backpacks. What do you like to pack? 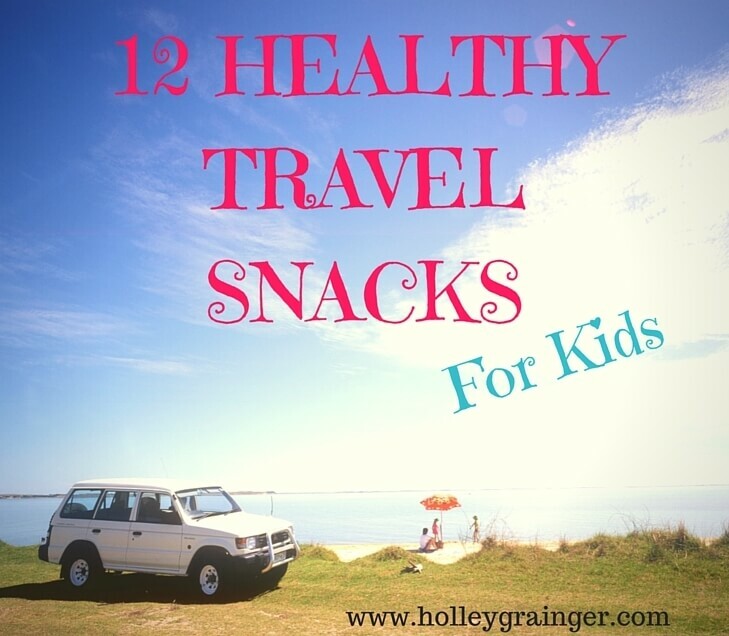 Below are 12 of my favorite healthy travel snacks (and yes, one is candy because mental health is important too!). 1. Whole Fresh Fruit: Sweet and portable, our family love apples, pears, grapes, nectarines, and bananas. I cut the grapes in half for the girls so they get a little juicier (ie. stickier) than I would prefer but whole grapes are a choking hazard for toddlers. 2. In-Shell Pistachios: The combination of fiber, healthy fat and protein from the pistachios will keep you full through your flight. Plus, the shells give you a visual cue of how much you’ve eaten. Just make sure to pack an extra baggie or container for the empty shells. 3. 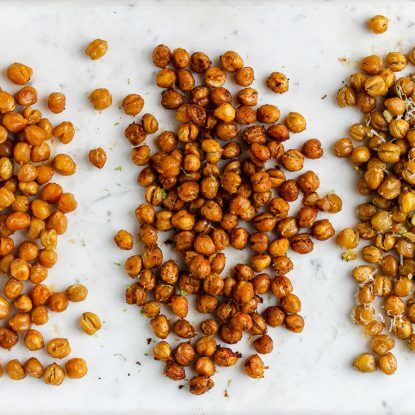 Low Sugar/High Fiber Cereal: Whether snacking on dry cereal, adding to trail mix, or pairing with milk for breakfast, dry cereal pleases many palates and is a quick go-to and mess free snack. 4. Hard-cooked Eggs: So maybe people look at you as the person carrying on the stinky food should you choose to open up the container holding your hard-cooked egg after takeoff but you’ll be the one smiling when you are left feeling full and satisfied thanks to the 7grams of protein per egg. 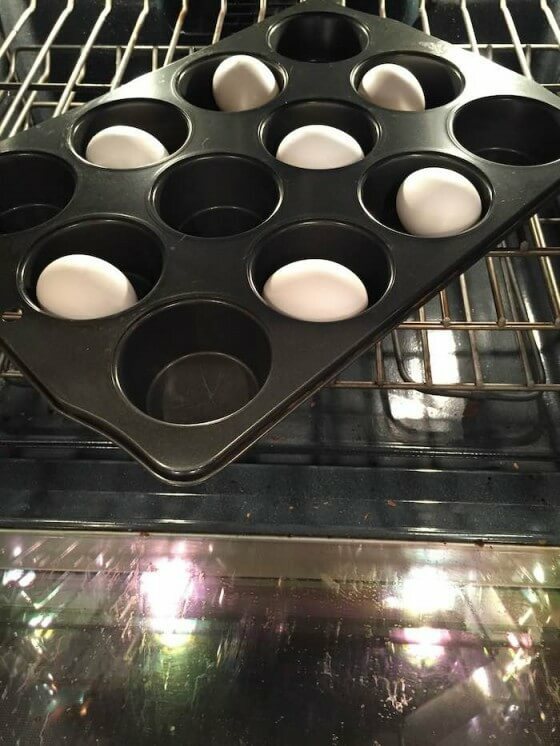 Check out this step-by-step guide to learn a quick way to make hard-cooked eggs in the oven. 5. Nut Butter Packets: These little packets are delicious paired with fruit, stirred into oatmeal, or smeared on a piece of whole wheat toast. Nut butter packets (like peanut, almond, or cashew) from brands like Justin’s, Wild Friends or Crazy Richards are a simple and satiating source of healthy fat and protein. And I won’t lie, I sometimes just squeeze them straight into my mouth or onto a square of dark chocolate! 6. Air-Popped Popcorn: If you choose to not pop your own kernels, then look for bagged popcorn that only contains corn, oil, and possibly salt. Avoid movie theatre-style popcorn (“yellow popcorn” as Ellie calls it) filled with fillers and loads of salt. 7. Do-It-Yourself Trail Mix: Create your own mix of unsalted cashews, roasted almonds, mini chocolate chips, dried apricots, candied ginger or if you’re going to purchase trail mix from the store, make sure to read the label and choose ones without unnecessary oils and preservatives. 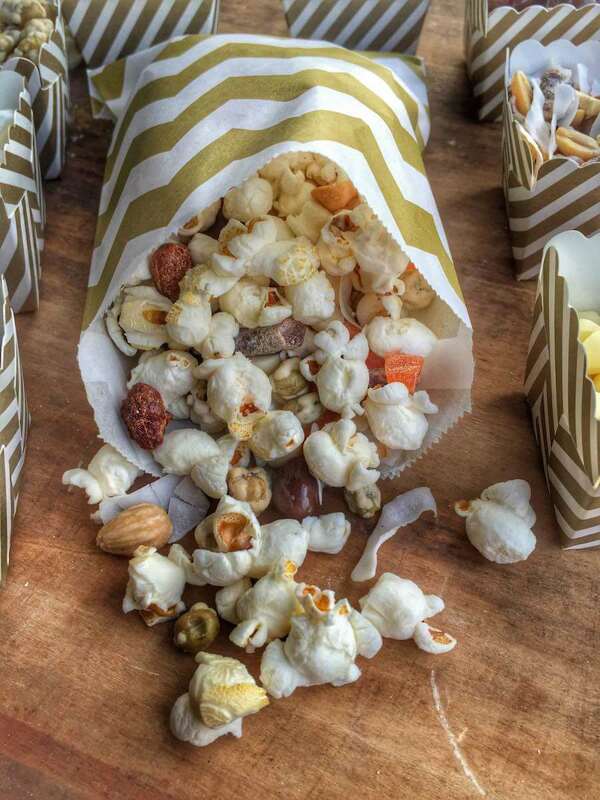 Check out my Gourmet Popcorn Bar for ingredient ideas and flavor combos. 8. Individual Hummus Containers with Pre-cut Veggies: Many brands have started prepackaging not only their hummus in individual snack-sized containers but also including veggies or pretzels. If you can find the ones with veggies, add these to your snack bag, otherwise, pack precut carrots, grape tomatoes, and celery sticks. 9. Your Child’s Favorite Candy: Desperate times call for desperate measures. Sure, stickers and coloring books and extra screen time are all great but sometimes an M & M or a dye-free jelly bean or a Tic Tac is just enough to stop a tantrum. 10. Mason Jar Meals: So technically not a “snack” salads and oatmeal prepped and stored in a mason jar are the rage these days because can be assembled ahead. 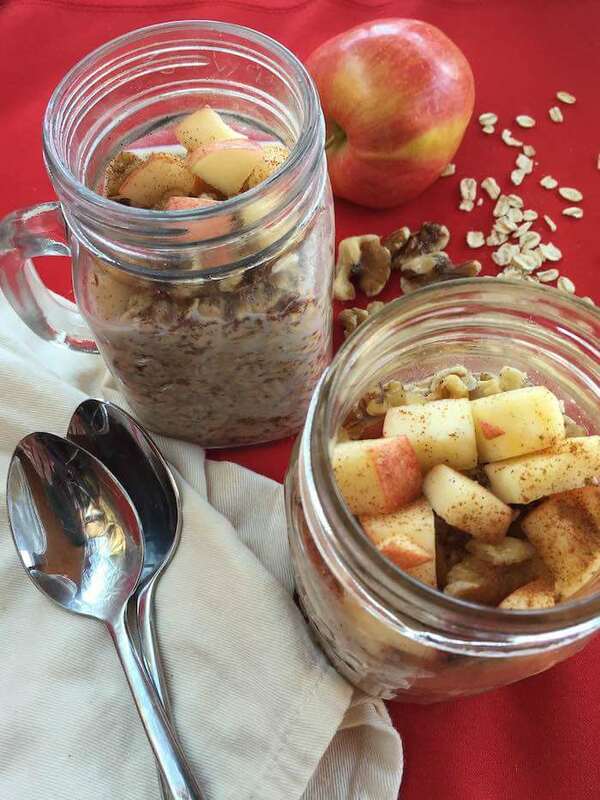 Make oatmeal like this Apple Cinnamon Overnight Oats or one of these yummy mason jar salad ideas (from Buzzfeed) and store in a small cooler in the car. These are sure to beat any drive-thru oatmeal or salad. 11. Snack Bars: I’m a big fan of Lara Bars and Kind Bars because of their simple ingredient list and amazing flavor combinations. Look for ones that offer protein, healthy fats, and fiber when possible. 12. String Cheese: Pack these little protein boosters in your cooler for a slightly salty snack that can easily be added to your mason jar salad, wrapped with deli meat, or eaten on their own. Water Bottle: If going through TSA, keep your bottle empty and use a water fountain or bottle filling station at the airport to save up to $5 per bottle. If traveling by car, filling up the bottle before leaving for home. Lunchbox: Go ahead assemble a lunchbox so that you can easily pull it out at a rest stop or on your flight for a quick picnic. I’ve gathered over 125 healthy lunchboxes for kids that I make for the girls so dig through this post to find some inspiration! What do you pack when you’re on the road (or in the air)? We’re always looking for new ideas so please make sure to share! That’s a really great idea, Kalee! I haven’t made energy balls yet but I know that the girls would love them. I always see people post them and I think that I need to jump on that train too. Thanks for sharing! 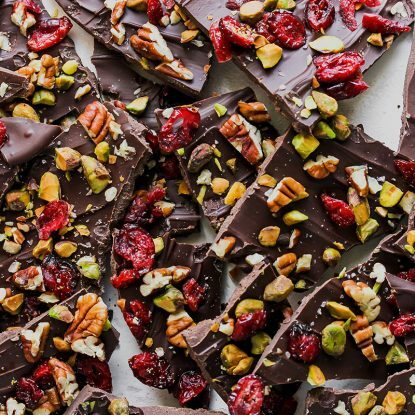 them with my 1.5 year old because I have always heard how high in sugar they are but would love to use some low sugar/high fiber ones as snacks! Hi Erin! We like so many! Cheerios, Kix, Shredded Wheat (i usually mix half sweetened and half unsweetened), Rice Krispies, Special K, Bran Flakes, or various ones in the Kashi line. So glad these suggestions will come in handy!